The development on Turkey Point Road has submitted their “final draft” of the proposed development plan for the county agencies to begin reviewing. Kim and I met with the developer to express community concerns and were able to achieve a number of concessions from the developer on issues that are important to the community. However, he is unwilling to lower the total number of homes for the development, a point which we be discussing at our next general membership meeting. Once the county agencies have a chance to review the plans, a final hearing is held in which a judge decides whether or not to approve the development as submitted, approve it with changes to address community or county agency concerns, or send the developer back to the drawing board entirely. The developer expects that hearing to take place sometime in January, and we will be kept abreast of that date and will share it with everyone. Because of the complexity of development issues, it’s best this is discussed at our next meeting, when Kim and I can articulate the changes we were successful in having made, and talk about what we would still like to see changed, that we can ask for as a community at the final hearing. In the interim, I can share that the development has been re-named, at the request of RBIA. The name will no longer be “Cape May Cove”, but instead will be known as “Osprey Pointe”. We are still working on naming the street. The Middle River Parade of Lighted Boats will be on Saturday, November 29th starting at 5pm. The parade will begin at Wilson Point Park and will pass by Carson’s Creekside, Riverwatch, The Crazy Tuna, Crescent Yacht Club, Conrad’s Ruth Villa/ Parkside Marine and Sunset Cove. It may be viewable form parts of Rosalie Avenue, and Bauernschmidt Manor, depending on how good your eyesight is. There may still be spots open at some of the local waterfront restaurants to make reservations. I have mine already! The Ballestone-Stansbury House will hold their 37th Annual Holly Tour this December. The mansion is one of the oldest structures in Eastern Baltimore County. The first weekend there will also be a civil-war encampment on site! This home is truly a historic gem in our community and the Holly Tour is a GREAT way to kick start your holidays! Dates are: Dec 6th from 5-8pm, Dec 7th from 2-8pm, Dec 13th from 5-8pm and Dec 14th from 2-8pm. Hot cider and fresh baked cookies served after each tour! On December 6th from 6-9pm the Essex Middle River Heritage Museum will be kicking off Christmas for the Essex community with a tree lighting on Eastern Blvd! This is a time honored tradition that the museum is working to bring back to life to help invigorate the Essex area and build a sense of community and holiday spirit! The Museum will also hold an open house that evening with a choir and refreshments. 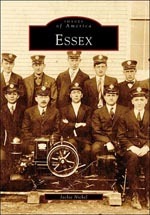 Please join us in reviving an Essex tradition! Greyhound Road Water Line Replacement Project Begins! Thursday was the “official” groundbreaking of the Water Line Replacement Project for the Greyhound Road portion of our community! This is a very exciting multi-million dollar investment in our community that I am very proud the association was able to secure for our residents. Hopefully water main breaks will soon be a distant memory for us once the whole peninsula has up to date lines! Although I do not know too much about the current status on Bobby B’s, or what exactly bobby’s intentions for the property are, I think it’s safe to rule out bar and or restaurant. Roughly two weeks ago, Bobby officially sold his liquor license to a new restaurant that was opening up in Rosedale. I do not know the price which it sold for. Since he no longer has a license, Bobby is no longer legally allowed to sell or serve any alcohol on the premises of that property. Kristi’s is still listed on the market as an active listing, but it appears that no one is interested in purchasing the property. We will continue to monitor that property.